Problems With Your Gate Intercom? Call Us At Gate Repair Encinitas! 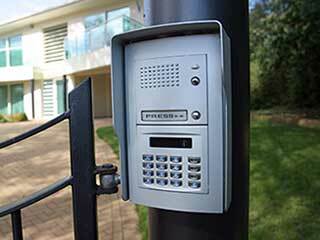 A gate intercom system is one of the best ways to secure your property without inconvenience. For a modern home or business owner, it can be hard to do it any other way! There are a couple of different basic types of phone entry systems, as well as a variety of extra features that can make them more flexible and secure. An intercom system has a control node inside of your property that links to your driveway or walkway gate. A wired link can be damaged or disconnected if the wire connecting your house to the gate is exposed, but it is also less expensive, and might just be the only option if your house is in a signal dead zone or your control system is in the basement. Otherwise, a wireless intercom system is probably the more convenient and reliable option. Some more modern systems include Digital Enhanced Cordless Telecommunications (DECT) technology. If you upgrade to a DECT intercom, you’ll be able to make phone calls from your phone entry system, making it easier to coordinate with friends and family who are trying to get in and out. If you have more than one gate connected to the system, this will also let you have multi-way conversations. Of course, a phone entry system is a sensitive device, especially when one end of it is outside and exposed to the elements. In addition to the device itself being damaged or suffering electrical failure, the cable used for a wired system can get cut or torn. Our technicians have years of experience diagnosing and repairing faulty intercom machines and wires, as well as installing brand new systems. If your intercom system isn’t working, or if you’d like to add or upgrade your driveway or security gate by getting a modern device installed, our expert team is just a phone call away. Contact Gate Repair Encinitas today and tell us what we can do for you.